The following experiences have informed and led me to this humanities theme. While doing ethnographic work with the Apsáalooke � �Children of the Large-Beaked Bird� (Crow) of Montana during the 1970s, I was introduced to a most amazing way of looking at and experiencing the world. This world view was repeatedly reflected in an uncanny ability of so many to simultaneously travel distinct ways of life, as for example, being a self-effacing �elder� and a self-serving �trickster,� of being a sincere Sundancer and devout Baptist, and doing so with such ease, keeping each path distinct and separate from the other, while at the same time seeing the varied paths in an indispensable relationship with each other and indeed part of a greater whole. Regardless of how seemingly irrevocably distinct from the other, these varied paths could be traveled without threat that they would somehow become mutually exclusive of the other. 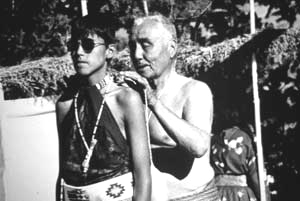 One of my most influential teachers, Tom Yellowtail, offered the following understanding. Using a metaphor he felt I could relate to, he spoke of the world as a great �Wagon Wheel� (Frey 1987:150-76). Tom was intimately familiar with the Wheel, as structured into the Sundance Lodge and the pattern of its dancers, and as reflected in the rock Medicine Wheel to the south of his Wyola home. 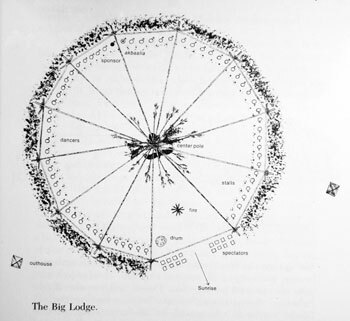 It was from an Indigenous way of viewing and knowing the world that the Wagon Wheel is informed and made meaningful. 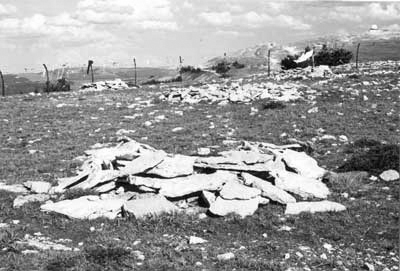 From its perch high atop the Big Horn Mountains of Wyoming, the rocks of the Medicine Wheel have endured since time immemorial, the recipient of countless pilgrimages and prayers. Its 28 spokes of rock were linked by an outer row of rocks some eighty feet in diameter and a central rock cairn of some two feet in height. As Tom has told in his favorite story, it was Burnt Face who first traveled so long ago to these mountains to fast and offer prayer, and who assembled these rocks as a gift to the Awakkulé, �Little People� who inhabited the area (Frey, Aripa and Yellowtail 1995:108-22). It's the image of the Wagon Wheel that was offered. Imagine the Sundance Lodge from the eye of a soaring Eagle. 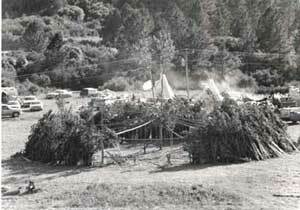 The Lodge is anchored by its cottonwood forked-tree, its Center Pole, from which twelve over-head poles radiate out to shorter posts to form the rim of the Lodge some seventy to eighty feet in diameter, all enclosed by cut trees and brush, its door open to the rising morning Sun. For three and sometimes four days, the over one hundred participants would fast from food and water, and offer prayer and dance. To the beat of the drum and song, and with Eagle bone whistles in their mouths and Eagle plumes in hand, men and women would charge the Center Pole, with its Buffalo head and Eagle suspended from its fork, and then dance back to their stalls, and then charge again, and again (Frey 1987:98-125). Each dancer has made an individual vow to the Creator to give of him or herself for a loved one in need, each dancer distinct in intentions and expression from the others. Nevertheless, all the dancers are united as one as they blow their Eagle bone whistles to the beat of the drum, and as they stand before the Center Pole and offer burnt tobacco in prayer, or as they might receive a blessing or healing, or even a visit from the Buffalo, or Eagle, or . . . . and be given a special gift, perhaps a "medicine." 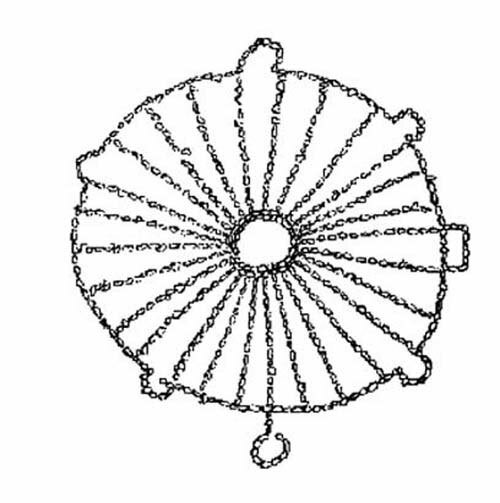 The image of the Wagon Wheel is seen and danced and experienced. During Tom's life and that of his wife Susie's the Wheel was lived. Tom was a akbaalía, a traditional healer, and the Sundance Chief for his people, as well as a devout Baptist. Susie danced alongside her husband in the Big Lodge and practiced Western biomedicine, in fact, was the first American Indian registered nurse in this country. While in the Sundance Lodge, Tom danced with the whistle and prayed to Akbaatatdía, �the Maker of All Things First�; while in the �Little Brown� Baptist Church he read from the Good Book and prayed to Jesus Christ. While in the Sundance Lodge, Susie applied Indian medicine; while in the Indian Health Service Hospital she prescribed Western biomedicine. But the Bible and the stethoscope were never brought into the Sundance, nor the Eagle bone whistle into the Church and hospital. Each way of prayer and of healing has its own spoke, distinct from the other, each with its own integrity; yet all spokes could be traveled, freely jumping between and on each, all leading to the same hub. This powerful notion was appropriately symbolized when in October of 1993 in Chicago Tom, in Eagle feather headdress and full regalia, shared the podium with some of the world's foremost religious leaders, including the Dalai Lama and offered words of prayer at the 100th anniversary of the Parliament of World's Religions. Tom's Apsáalooke prayer for world peace was so easily heard, mingling and merging with the over 5,000 other spokespeople from the world's different religions. Driftwood along the far bank of the Yellowstone, 1993 For Tom and Susie there need not be investment solely in a single spoke but choice to travel the many, when recognizing that the many are inexorably a part of a greater, single whole. A bigger picture is at work. For them Akbaatatdía, the Creator permeates the many spokes equally. The many are linked in a particular relation to the hub and rim, and to each other, equal in length and in distance between. Without such, there would be little turning of the wheel. 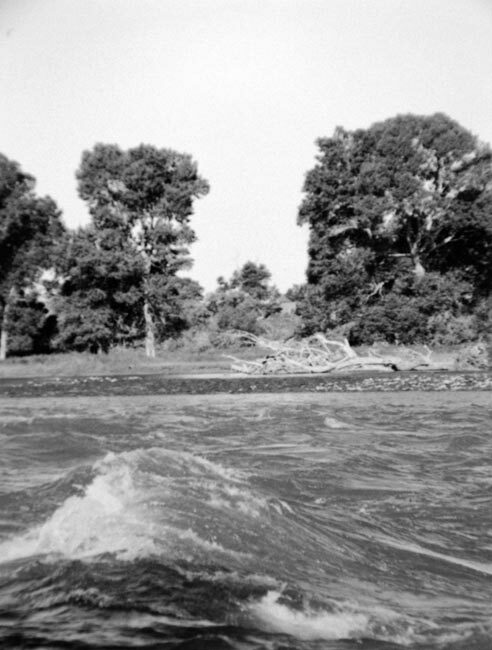 The Apsáalooke term for a clan is appropriately, ashammaléaxia, �as driftwood lodges,� the social unit comprised of many matrilineally-related, extended families. It's a term applied broadly. Imagine looking out onto the Bighorn River. Individual pieces of driftwood don't do well in the fast moving currents, bashed against a boulder there, submerged in an eddy here. But there along the river's bank the driftwood is lodged into a large bundle, each of the many logs of driftwood in critical relationship with another, each supporting one another, the whole enduring well in that turbulent river of life. It's a relationship expressed by the Nimíipuu term té k'e, or Apsáalooke term ammaakée, "an ethic of sharing" with all those in need that binds the driftwood so tightly. The Wheel and ashammaléaxia have facilitated the compartmentalization of the many while embedding them within an interdependency of the greater whole. The Wheel and ashammaléaxia have provided a map for traveling of the many paths without dilemma, without having to make an either-or choice, so long as each path is traveled appropriately. For Tom and Susie the critical competency is in knowing which context and setting to be a self-serving �trickster� and a self-effacing �elder,� a devout Christian and a sincere Sundancer, a skilled nurse and a giving spiritual healer. Certainly one needed the necessary competency to effectively travel any given spoke, but also the competency in knowing that only when the integrity of each individual spoke in relation to the others is maintained does the wheel turn. It's a competency in knowing that only when the individual logs of driftwood are kept distinct and strong in relation to the others does the lodged driftwood survive. It's not unlike a Pow Wow dancer. While wearing his Traditional regalia, the dancer moves with reserved dignity grounded with the earth, but while donning his Fancy Dance regalia that same dancer spins and leaps with vigor as if soaring above the earth. 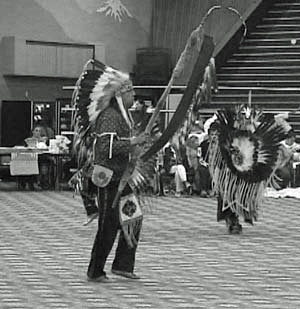 The dancer is free to dance either style, but in attempting to do so he must be keenly aware of the differing skills and moves needed for and etiquette associated with each dance style � keenly aware if the two eagle-feather bustles are to be worn, or the one or none at all as with a Traditional Dancer. And then there is another regalia worn at his college graduation, indicative of yet another separate set of skills and moves the dancer has acquired. Each regalia is distinct from the others, each appropriate for a different path, but each can be donned by the same dancer, with the competency to know the difference. The dancer would never attempt to spin and leap while in his Traditional regalia, though he might in his graduation gown! From the many regalia a Pow Wow is made whole and one, each of the many in its proper order and place following the Eagle Staff of the Grand Entry. For them they can effectively don the many regalia and travel the many paths, the many spokes, when acknowledging the interdependent relationship of the many within the greater whole, while at the same time distinguishing the unique significance of each of the many and discerning on which path it is appropriate to don each regalia, each way of knowing and experiencing the world. And I wonder aloud? If we are to effectively engage with and understand the distant and many strangers amongst us, separated by such divisions as class, ethnicity, religion, culture or even by academic discipline or epistemological paradigm, are not the lessons from the hub and rim, of our shared humanity, just as critical as the lessons from the spokes, the lessons of our human diversity? Can we not celebrate while also critiquing that which is unique and particular, as well as that which is universal and ubiquitous in our lives? What are the implications in viewing the spokes in our existence as fundamentally equal, while acknowledging some sort of an all-pervading hub and rim? Can we in our own lives transverse the seemingly "mutually exclusive" as easily and effectively as Tom and Susie did in theirs, with Christianity, Western biomedicine and its science, and their Indigenous ways? Do not the lessons from Tom Yellowtail's Wagon Wheel ultimately speak to our capacities for civility, communication, collaboration, compassion, creativity and community, . . . for what it means to be human? See Interplay and Implications for further extensions of the Wagon Wheel.